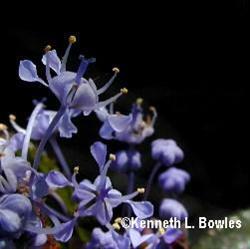 This form of Ceanothus is a shrub that grows to about 6-12 ft and is found in a wide range of habitats. This is the species most commonly gracing the hillsides of inland San Diego County, providing an annual spectacle for drivers and hikers alike. In early spring hills will be purple wherever the natural habitat has been allowed to prevail. It blooms heavily and the flowers vary in color from white to blue. It is effective as a screen in hot inland areas, and could also be used to transition from a garden landscape to the chaparral. typically the tomentosus will go summer dormant as it preserves its energy to survive through the hot, dry summers.